The character of a region depends on its shape. Leave the edges unregulated, and invite sprawling suburbia and long commutes down miles of highway. Restrict the edges, and, theoretically, get tall buildings, dense cities and walkable neighborhoods. Or, others would argue, those restrictions could strangle the economic growth that feeds the region. Last Wednesday, activists, neighbors, urban planners, developers and school district officials crammed into the county commissioners’ hearing room — lining up on the aisles, peeking through the door — to debate expanding the Urban Growth Area, or the UGA. The mayor of Spokane, the Washington State Department of Commerce and a panel of planners from local municipalities have all come out against considerable expansion. But Spokane county commissioners, taking a combative attitude toward several skeptics at the hearing, believe there’s good reason to expand. They’re expected to make a final decision later this month. “If we don’t expand the UGA, we hurt ourselves in our ability to attract new business,” Commissioner Al French says. The new Caterpillar plant, he says, was built within the current UGA, but just barely. The Washington State Growth Management act, passed in 1990, requires every county to manage an Urban Growth Area. Inside the area, the municipalities must provide services like sewer, water and transportation, but development can be denser. Outside the area, development is limited and lot sizes are large. Those boundaries can impact traffic patterns, transportation costs, the environment, quality of life, economic growth and regional character. For more than six years, Spokane County has debated changing those boundaries. The latest proposal, Alternative 5, would add nearly 6,000 acres to the UGA. 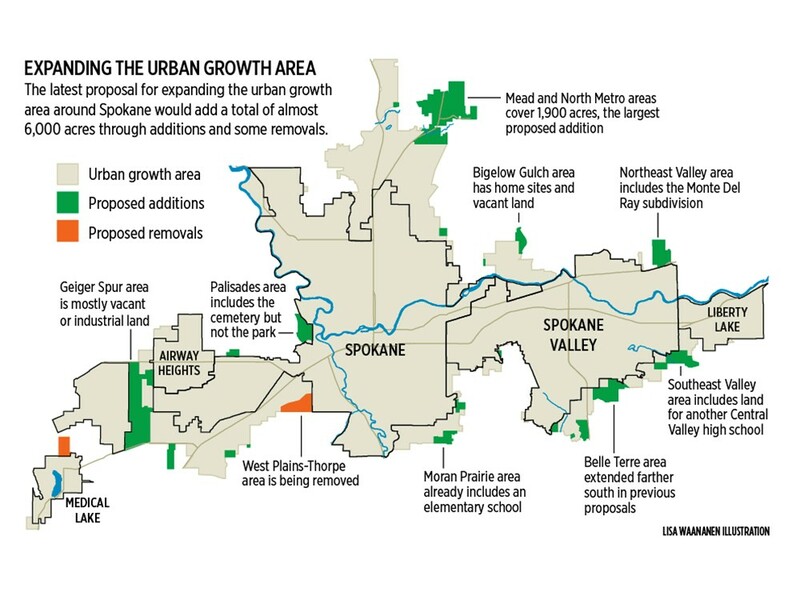 Of the five proposals, it’s the largest and includes Belle Terre, Mead, Bigelow Gulch, Moran Prairie and areas to the northeast and southeast of Spokane Valley. Sometimes the arguments for expansion were specific. Commissioner Todd Mielke worries about several neighborhoods on septic systems — even if those systems fail, the county still can’t extend sewer lines to them. And as Liberty Lake grows, the Central Valley district needs a new high school, but the land they’ve previously purchased is outside the UGA, preventing construction. But the general debate centers on an underlying question: Can the current growth boundary handle the county’s increase in population? Answering first meant predicting population growth. The Spokane County estimate was optimistic, predicting at least 56,000 more people in the county by 2031 than the Office of Financial Management’s recent medium estimate. Mielke says it’s better to err on the side of more growth rather than scramble to add unanticipated infrastructure. Yet historically, Spokane County has overestimated its population projections. Last time around, the population in the city of Spokane and rural areas grew much slower than expected, and the projection fell short by nearly 18,000 people. The issue pits the county government against the city government. French, who previously served on the Spokane City Council, says the city of Spokane took more than a decade to update its development regulations to allow for more density. Chesney says the city is in the process of dramatically overhauling its zoning codes to allow denser growth inside its boundaries, and allow neighborhoods more flexibility. Neighborhoods might support density in theory, Mielke says, but when an apartment complex goes up next door, they complain. Some argue the reason the city of Spokane hasn’t become more dense is precisely because of cheap, available land in the county. The county estimates the proposed expansion cost to be only $2.5 million more than leaving the UGA alone. But Dave Andersen, representing the Eastern Washington Department of Commerce at the hearing, believes they’re underestimating long-term cost. Roads, sewage pipes and water lines all have maintenance and replacement costs. “It’s better for the community, for how it looks and how it feels and how it performs, to have more compact areas with fewer vacant spaces,” Andersen says.